Many of these events might be of restricted interest, and may be broadcast to a narrow audience demographic. They may be regional news events which require a lot of content generation in a short space of time. They may require temporary infrastructures which need to be highly portable. Remote production technology provides a realistic alternative for these events - the production of high quality content with fewer resources. The barriers to effective remote broadcasting are speed (or latency), control and infrastructure. 1. Speed; the single biggest issue. Broadcast audio workflows rely on effective monitor mixes with no latency. This can be difficult to achieve when your studio is hundreds or even thousands of miles away. To avoid the audio making a long distance round-trip, on-site remote production equipment should have local DSP to generate monitor mixes and IFBs with no latency. An operator in a remote studio will then need direct control over channel functions such as mic gains, aux send/monitor mix levels and fader levels from the remote console control surface. Next, there needs to be a convenient method for configuring the DSP and bus configuration on-site. It must be simple for on-site engineers to set-up IFB routing and remote monitor mix levels at the venue, especially considering that many remote production broadcasts do not utilise as many staff. These considerations guarantee that venue infrastructure, routing and monitor feeds are functional prior to transmission. Local DSP processing also means there is no latency for commentary or talent monitoring. With all DSP processing for monitor mixes taken care of on-site, the studio transmission console can concentrate purely on the main programme mix. 2. Control; operators need real-time control over mic gains, fader levels and monitor mix levels. Effective remote production requires a simple method to control the parameters of the remote production unit from a control room located many miles away, giving the operator control over channels, busses and other parameters from the studio control surface. In other words, the operator sits behind a console that he is already familiar with and assigns remote channel paths to local faders, just like any other channel. This functionality should include channel path fader levels and cuts, aux send levels and ons, aux master levels and cuts, VCA linking via the studio console, as well as control over EQ, dynamics and direct outputs. The operator needs to independently mix all the remote site IFBs and aux buses in addition to the local transmission mix on the studio console. For full scalability, there should be the ability to link multiple remote production units to the same studio-based console. This is useful for shows with multiple events happening simultaneously..
3. Infrastructure; transport is always an issue! Multiple synced signals need to be moved in real time, and down the same physical infrastructure. Audio, data and video all need to be considered, as well as multiple control protocols. Infrastructures need to be versatile to connect via a range of transports allows the broadcaster to use their preferred transport methods, minimising initial expenditure and giving confidence in using an established transport mechanism. The studio console mixing the transmission can in turn assign these signals where required on the desk, so workflows are exactly the same as any other broadcast. Working in this way means the learning curve is shallow and transitioning to a remote production workflow causes minimal disruption. As our industry develops, these transports need to develop too. The flexibility to incorporate changing AoIP and IP protocols like Dante, AES67 and even SMPTE 2022, is essential. A remote production unit should be flexible enough to deal with any transport. 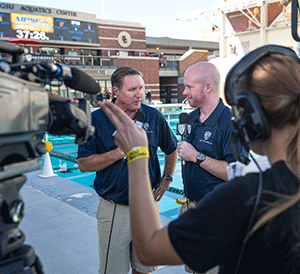 Broadcasters, such as PAC-12 in the USA, have been developing the concept of remote production for some time. Nonetheless, simple connectivity and control, combined with a fully integrated solution that delivers these very exacting requirements, has only recently become available. Remote production units, like Calrec's RP1 for example, offers all this functionality whilst maintaining a focus on high-quality audio performance and reliability. Remote production broadcasting means fewer resources are needed on site, and controlling audio from a remote console saves money on setup time, crew, logistics, and equipment. It is far simpler to set up than a traditional OB truck which may not be financially viable in many scenarios where remote production is currently being considered. Remote production technology also allows broadcasters to create very low-cost on-site networks for all audio routing requirements. Utilising existing hardware onsite, it provides a cost-effective way to adapt to the requirements of any situation. Fundamentally, it enables broadcasters to cover a greater number of specialised events at significantly reduced costs, making it possible to develop an increasingly wide range of content, and with no drop in quality.